I got Andrew Skurka’s TheUltimate Hiker’s Gear Guide: Tools & Techniques to Hit the Trail for Christmas. He defines an ultimate hiker as someone who wants to maximize their walking time and minimize their in-camp time. It’s an awesome book. I have not yet hiked with a kid that is an ultimate hiker. Bedtime routine is important for most kids, and the less experienced and/or younger they are, the more important that routine is. Changing locations for bed, potty, teeth… Exchanging city and house noises for outdoor sounds… While those are comforting to adults, they are unfamiliar to kids. They may be scary or exciting, but they won’t help your kid get to sleep, or eat enough dinner (distracted!). Younger kids may be clingy and get in the way. A kid who needs an hour plus of strict routine at home will likely take a lot more time to settle in camp than a kid who does fine with jumping into bed and going straight to sleep. The younger the kid, the more they’ll need to get used to the campsite to be comfortable. Baby Boo staying up Very Late to become comfortable in the tent. 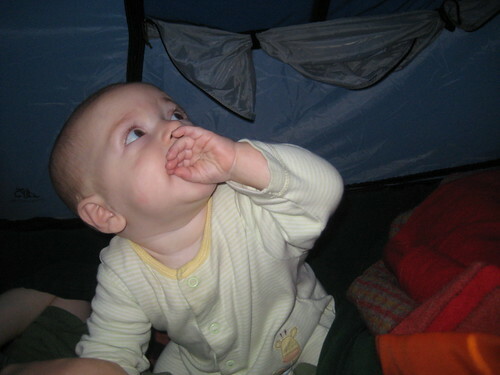 As a toddler, Boo stayed up well past 10, singing to a full car-camping campsite. We hadn't given her enough time to acclimate. At almost 3, she needed well over an hour of running around camp exploring to be able to do anything else. At 4 ½, she “helped” set up and then took half an hour to acclimate before being ready for an exploring hike. If you want to shorten the settling in period, make your kids as familiar as possible with the whole thing ahead of time. Set up the tent in the backyard, sleep in it if you can. Hike in the same or a similar area. Carry their favorite book and the blanket they have always slept with (no matter how heavy). Talk about what’s going to happen. Look up trip reports or pictures from your destination with your kid. Going over the map and having the kid discuss what to pack is also good practice. As with everything else, know your kid. Your first outing you should probably give yourself a lot of leeway and time to settle in camp, until you know how much and what kind of things are important for your kid to settle in at camp. How do your kids get settled in at camp? Have you ever seriously failed?